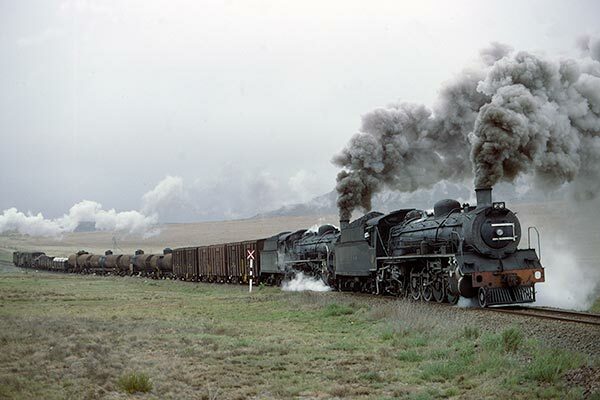 Caption - South African Railways 19D class 4-8-2s 2664 and 2744 head the 1310 Sterkstroom to Indwe goods. With slippery rails after heavy rain and a heavy load, the two engines were struggling to keep the train rolling. Despite the lack of sun, it was a marvellous sight captured in October 1980. The Maclear branch was one of the scenic highlights of South Africa with scenery often reminiscent of Scotland, certainly on a rainy and overcast day! The gradient changed frequently and the line needed skilled footplate crews to maintain the service.